This paper presents an essay on new methodologies for "cultural language literature" called Korean language literature as an attempt to take the crisis of Korean language literature today serious and innovate and overcome it with a theory of culture. The crisis of Korean language literature today is attributed to academic abstractness due to excessive professionalism and social alienation due to the absence of communication with the public. A new term to overcome it in a practical fashion is "cultural language literature." Cultural language literature means an approach to language and literature based on a theory of culture. The specific objectives for it include overcoming the limitations of research centered around texts, discovering living culture through a microhistoric approach, establishing an integrated and trans-boundary perspective, conducting a pragmatic research, and discovering and globalizing local culture. The present study set such research directions as research on Korean language literature of communication and cooperation, activation of local unit culture research, and implementation of practical values of language and literature study. Cultural language literature is not an established methodology but a progressive one currently being created, but there are already grounds for its existence owing to the limitations with the inside of Korean language literature and the academic and cultural requests on the outside. The study proposes cultural language literature, which is new language literature to pursue both professionalism and popularity in such an academic flow, and expects the new development of research breakthroughs in Korean language literature based on the establishment of cultural language literature theories. Haneoyuchui(韓語類聚) is the end of the 19th century during the Joseon(朝鮮) who lived in the Japanese Hashimoto syoyoshi(橋本彰美) Korean words and sentences, and folk songs were collected and recorded books. This book is a kind of encyclopedic writing, which this book because it is a very broad range of topics. This is what Hashimoto syoyoshi wrote in this book is the complete one of the intended. Hashimoto syoyoshi copied Japanese-Korean dictionary for writing, he learned Korean. And taught Japanese to Korean, Korean to Japanese to teach the children had their livelihood. Associated with old stories and poetry, he left a variety of transcription. The significance of this book is based on a specific region resulting fact that individuals are collected and recorded. The end of the Joseon in the 19th century, inhabited by the Japanese and the Korean is important to clean up. And look at the end of the 19th century, the living conditions of the material. Because at the time was using the same dialect and local folk songs sung on the record was collected. Meanwhile, the book did not put attention to the composition and to look at some of the attributes to be the purpose of this paper. And he wrote this book in connection with the purpose of data analysis. In conclusion, the three motifs made for the purpose of this book. It is thename of the object(物名), colloquial, collection of folk songs. The present paper has two big goals. The first aim is to extract word sequences which have high keyness in academic corpus and to discuss about a methodology of the extraction of academic key-sequences. The second aim is to consider discoursal functions of academic key-sequences distinguished from academic formulaic expressions which have high frequency in the corpus. For these goals, we use two kinds of corpus, one is, as a target corpus, 400,000 words academic corpus in the field of Korean linguistics and literature, the other one is, as a reference corpus, 10 million words a Sejong written corpus. We use these two corpus to extract word-sequences which have a relatively high keyness as well as absolutely high frequency. For identifying key-sequences for the corpora, the tool used is the program called KNU-Combiner produced by KNU research team. In order to calculate keyness, chi-squared test was used. The finally extracted key-sequence list tells us that academic key-words show the topic of the academic field, whereas the key-sequences represent the stylistic traits of the academic field, and that key-sequences play a role as a semantic unit in a specific genre like a word. The color words, as the description of natural colors, constitute one of the essential lexical systems in vocabulary. Not only do they contain the sense of colors, but also embody cultural norms of different countries, making the language more vivid and meaningful. Based on the nature of the color, using the color words in a metaphorical way is able to project the specific characteristics of people and objects including time, space and status which are of abstract concepts. This paper will first analyze how this projection works in black color from Chinese and Korean linguistic point of view, and investigate its cross-domain cognition through the theoretical basis of typological, contrastive and cognitive linguistics. The results suggest that in terms of the color black, it can project the domains of concrete and abstract concepts in both Chinese and Korean. However, some of the details in each domain exhibit a slight difference. The emotional projection, for instance, the Chinese projection is far more pejorative than Korean. This can be explained by the fact that, even the adjacent location has generated similar culture between two countries, however, as time went by new elements have been added to both cultures which were considered to bring influence to people’s cognition. As a result, the projection domain in terms of using of black color has both similarities and differences in Chinese and Korean culture. This paper explores the usage and function of negative sentences in Korean spoken language. Korean negatives are expressed with long forms(‘-ji an-’ negatives) or short forms(‘an’ negatives). Traditionally many studies of negation have been focused on whether the meaning is the same in their surface forms as well as deep structure. However, negative sentences have various functions in a discourse: negation of a hearer’s presupposition, proposition of speakers’ attitudes and politeness of hearers. Therefore this study analyzes the language data and investigates the functions of negation in oral communication. If we analyze the usages of negative sentences in a spoken corpus, we can explain the functions of negation. The corpus used in the study consists of many spoken texts from <21st century Sejong Project> corpus. It comprises around 340,000 words in transcription texts of conversations. As a result of analysis, the short form negative sentences are used more than long forms in conversation. Using negative sentences, the speaker negates corresponding affirmative meaning, and corrects what hearers believe to be true in a discourse. These functions of negation are generally found in short forms in Korean spoken corpus. In contrast, the speakers use long forms to express their politeness. The use of these negative sentences is speaker’s strategy for avoiding conclusive remarks. The interrogative negative sentences are used for demanding the hearer’s identification of negative presupposition or negative facts. Generally Korean speakers use short form negative sentences for demanding the hearer’s identification. But, interrogative negative sentences express indirectly the illocutionary force of statements. Mostly these functions of negation are found in long form negative sentences in Korean spoken corpus. That is, Korean speakers use long form interrogative negative sentences for demanding the hearer’s confirmation or expressing their thought indirectly or carefully. Because these sentences expose the affirmative speaker``s presupposition clearly, negative functions are weakened. And Korean speakers use long form interrogative negative sentences for drawing hearer’s knowledge or emphasizing their information. In conclusion, the short form negative sentences mostly have function of expressing negation but the long form negative sentences have function of expressing speaker’s attitude in Korean spoken language: politeness to hearer, weakened affirmative and emphasis of their information. The purpose of this study is to research that why Park Ji-won described the details of ``s inclusion inexplicitly which has caused the controversy about the original writer of this novel, and how it interrelates with ``s multifaceted thematic consciousness. By this study, it will make ``s research works more deeply and solve the controversy about the writer. by examing ``s ``Jeonji`` and ``Huji``, three people doubt a writer of this novel; unnamed Chinese enraged by the 18th China``s situation, Park Ji-won who copied and modified , Sim Yu-bung, the a storekeeper, who had possessed . This ambiguity is a intended result by Park Ji-won, rather than just some kind of mistake. Then what is Park Ji-won``s intention? In many preceding researches, it``s estimated at the way to aboid criticism and attacking from the conservative literary world and Confucianists of the day, or to increase reader``s intrest in . But these explanation are not enough. On July 27 in 「 Gwan-nae-jeong-sa」, one day before July 28 which includes , Park Ji-won described some stories about ``Chun-chu-dae-eui``, and borrowed other people``s voice instead of himself so that the meaning of stories are reinforced. We can understand the controversy about the original writer of in the same vein. Indeed, three people who doubt a writer of and this novel``s three multifaceted themas can be connceted one-by-one each, and then the thematic consciousness of is reinforced. This is the same situation with many preceding researches has connected ``s main thema and it``s original writher. However, Sim Yu-bung, the third person who can be a writer of , has not received attention. So this study proved that Sim Yu-bung can be a original writer of sufficiently. In conclusion, Park Ji-won intend that ``s thematic consciousness become multifaceted, so he described the details of ``s inclusion inexplicitly and made the controversy about the original writer of this novel. Therefore, the study in the future about ``s writer and main thema should being Park Ji-won who record this novel intended the diversity of interpretation of . 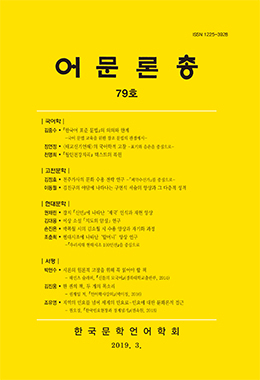 This paper presents an investigation into classic poetry by taking an approach based on theories of culture and developed discussions with Nonggawollyeongga(농가월령가) as the main text. The present study reviewed the cultural traditions and contexts of the times involved in its creation and examined the ripple effects of its creation on later generations. The study looked into in more details the cultural traditions involved in the creation of Nonggawollyeongga(농가월령가) including the tradition of monthly order and promotion of agriculture, that of books on agriculture, that of connections with almanacs, and that of Nongbuga-type gasa(농부가류 가사). The investigator questioned why Jong Hak-yu created Nonggawollyeongga (농가월령가) in the 19th century to understand the contexts of the times related to its creation and paid attention to the content of promotion of agriculture and words of the king in its Jeongwollyeong. Based on the finding that the content of Jeongwollyeong agreed with the promotion of agriculture and words of the king in the 33rd year of King Sunjo``s reign(1833) in considerable parts, it was estimated that the poem was written in that year. Written in Namyangju, Gyeonggi Province(경기도 남양주) in 1833, the poem was spread to many other regions since. In the process, it seems to have given birth to new Wollyeong-style poetry(월령체 시가) and had certain influences on the changing styles of the genre painting called the painting related to plowing and weaving for farming or the painting of seasonal customs. One of distinctive features found in post-war poet Kim Jong-sam’s poetry is awareness of death. But behind the sense of despairing death is his strong will to overcome the bleak reality and existence. This is an important element in that it corresponds to his conciliatory gesture and communication between his being and the world. However, previous studies on Kim’s poems have mostly focused on the theme of death awareness and little attention has given to consideration of awareness of life. Likewise, not much efforts have been made to explore close relations between the awareness of life and metaphor in his poems. In this regard, this article put emphasis on finding correlation between awareness of life and metaphor in Kim’s poems. To do this, I used Hrushovski``s frame of reference theory that helps to understand metaphor at the discourse level. The awareness of life reflected in his poems is taking shape as metaphors of poetic self, others or music. First, his will to live is gradually sanctified by the transformation of the poetic self. Second, transcendental life pursued by the poet is realized by the reification of others consisting of the world. Third, as layers of music are shifted to spatialization, the poet’s arrival at the transcendental world is achieved. Based on these factors, this article highlighted Kim’s awareness of life unfolds as it creates delicate semantic network by the poetic device of metaphor. This article is meaningful in that it explored the correlation between awareness of life and metaphor in Kim Jong-sam’s poems that have attracted little attention from the academic circle until now. There are female writers that are based on love affair, Choi Jeong-hee, Lee Seon-hee and Baek Sin-ae, and in their novels written in the protagonist being the married modern women, the duplicity was focused on and compared among the novels , , . In , ‘I’ had left home thinking of a divorce but was returning home since her lover was persuading her to. The ironical aspect she shows, that she stays loyal to her husband and loves her child in order to continue her love with her boyfriend, is a sign of duplicity in female novels. In , in the last part, she showed the duplicity of alleviating the violence of the rouger through a comic speech. In , ‘I’ am a divorced woman, and her lover and colleague S was encouraging and advising her to set free from her family and take steps into the society. Despite her lover’s death, she persuades her mother and tries to participate in the social movement again. This shows duplicity through an attitude that embraces opposing values.